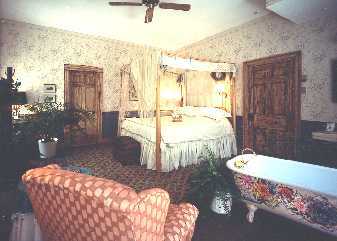 Each of our nine bedrooms has its own bath. Eight with a ball and claw foot bathtub, pedestal sinks w/brass fixtures and toilets. These tubs seem appropriate to encourage our guests to step away from their usual routines of life. A relaxing soak with a good book or good company is just the thing for our stressful lives. Dolly DuFour, a local artist, has masterfully painted the exterior of each tub to complement the theme of the rooms. The themes were chosen based on our extensive collection of antiques and a desire to offer something a little special in each bedroom. This is the most perfect lover's retreat you'll find. The walls are decorated with hand painted fleur-de-lis on a peach background. A 1775 rosewood half-tester FULL SIZE BED as old as the Southern covered with pure white linens wows... until you notice those claw foot tubs. The pair faces each other, allowing you to gaze at your true love as you soak in billowy bubbles (compliments of the Southern.) NO SHOWER. Open bathroom W/privacy screen toilet & sink. This is the most 'Victorian' of our rooms, so named because of the eras passion for the overblown, multi-petaled, most fragrant rose of them all. 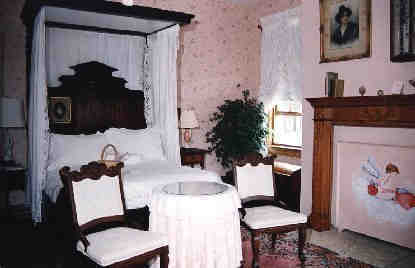 We chose simple walnut furniture (Civil War era) for the room as befits a country dwelling. The BED is a QUEEN. However, the real star of the room is the fan collection over the fireplace. Fans did a lot more than stir the air during the Victorian era. By the 17th century, Paris was the undisputed hub of the fan making industry. The subdued colors, somewhat of an English feel and of course, our gentlemen's portraits inspired the name. 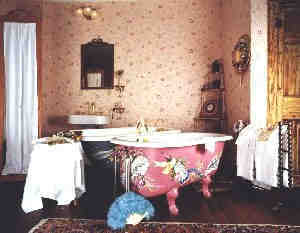 The claw foot tub was painted by Dolly and resembles an English garden. 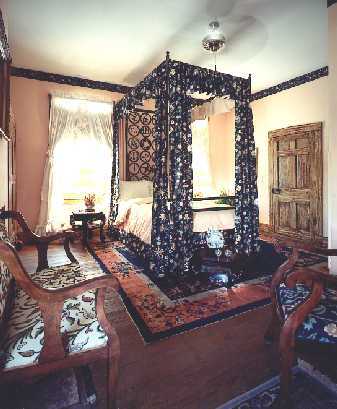 Japonisme was a word coined by the Victorians to describe a room decorated with Orientalia. Our collection of over 150 carved soapstone pieces are displayed. Soapstone is a soft, greasy mineral that is indeed used for soap in the far east. Appearing in all colors, pieces were made as gifts and remembrances. During the 1880s it began to appear in the United States and Victorians, with their usual passion for excess, collected it. The bedside tables and the bronze ceremonial pots are Chinese in origin and date between 1820 and 1850. The FULL SIZE BED is a one of a kind, as I designed it. The headpiece is composed of metal rings, each one made by a different blacksmith and demonstrating his particular area of expertise with metal. The one of a kind rings were made by the Missouri Blacksmith Association in 1986. The Captain's Room is now being offered to our guests. This 2nd floor room has a private balcony overlooking its own garden. 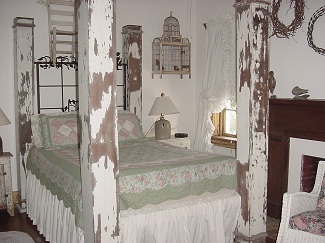 The one-of-a-kind queen size bed has 4 posts recycled from an 1870's home. The enclosed bath has a step-in shower, pedestal sink & toilet. Three tables a bookcase and a wicker table and two wicker chair completes the room. The covered balcony has two wicker chairs with cushions & a wicker table. Grandma Rachel's hand pieced quilts, children's roll top desks, 200 year old beds, old trunks, and many treasures brought to us through the years. Prices may vary due to special events. There are four bedrooms on the third floor. Each bedroom has its own bath with a ball and claw foot bathtub W/shower combo, Open bathroom W/privacy screen pedestal sinks w/brass fixtures and toilets. These tubs seem appropriate to encourage our guests to step away from their usual routines of life. The themes were chosen based on our extensive collection of antiques and a desire to offer something a little special in each bedroom. A relaxing soak with a good book or good company is just the thing for our stressful lives. Charles Wysocki is an American folk artist whose work we began collecting in the 70's. All of his work is very distinctive and contains a hidden element of humor and has always made me smile. Can you find the fox in Fox Run? That's the print hanging over the chest of drawers that has been decoupaged with scenes from the calenders Wysocki did. 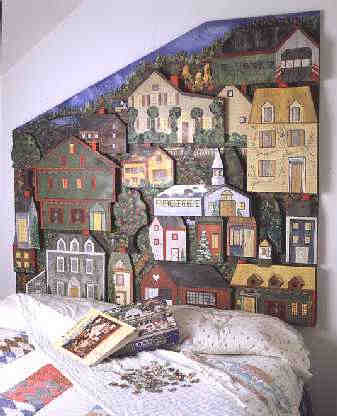 The headboard of the bed Barbara did, with scraps left over from the building of the kitchen cupboards. This was a work of love as it took over three months to complete the three demensional piece. 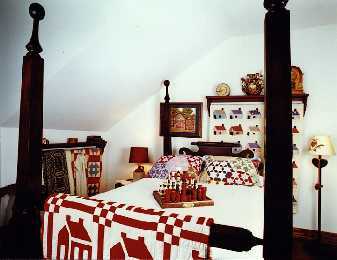 I suppose it personifies the sampler hanging above the double chair ("Use it up, Wear it out, Make it do, Do without"). A footboard was planned in the same three dimensional style, but a trunk was used instead. This has a QUEEN SIZE BED. The folk art makes this a cozy room, at its best on a crisp fall afternoon when it is flooded with reflected reds and golds from the sugar maple next door, leaves all ablaze. Open bathroom W/privacy screen has clawfoot TUB/SHOWER combo, toilet & sink. 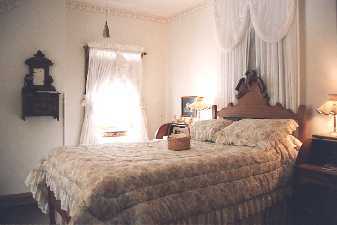 $125 per night plus fees & taxes. Barbara thought it only fitting that Lulabelle, her doll and one of the few things to survive her childhood, deserved a special place in our new home. Surrounded by the dolls dresser and Murphy bed, and her clothes trunk nearby, she sits serenely in her ladderback made by great grandfather. The rolltop desks also belonged to Barbara and her sister Sharon. Many happy hours were spent playing school and store by our children as well as the two sisters and still bear the marks of our children at play. A very dear friend, named Paul of course, volunteered many hours here and this room was referred to as his room (a very long story). The FULL SIZE brass bed,175 years old bought at a junk store, took four weeks to polish the first time. Kathy, another close friend, and Barbara used Porter's Friend and enough steel wool to take off their fingerprints. It turned out beautifully and the man in the junk store never learned what happened to the $4 bed now worth $1400. Among Dolly's favorite things are birds nests and violets, this was the room to indulge both passions on the tub. 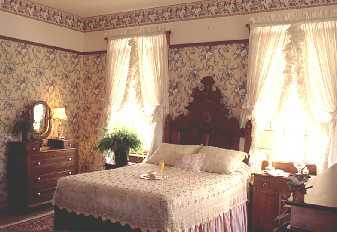 Barbara stenciled the border at the ceiling, under the ceiling fan and the walls behind the tub. Dolly has painted the wonderful "Violet Seller" one of several "silent people" she has done for the Southern. Open bathroom W/privacy screen has clawfoot TUB/SHOWER combo, toilet & sink $125 per night plus fees & taxes. Great grandmother Rachel was always there, making a pie by feel or reaching for a scrap to piece up a quilt. 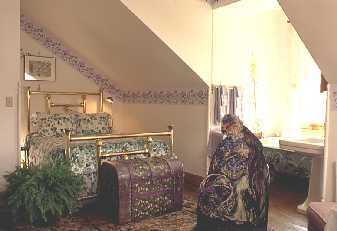 Many of the quilts displayed and used in this room are hers, stitched by hand and quilted at the church on Wednesdays. This is a warm and cozy room which contains some of our favorite things, all with a story. The $5 pie safe that took all the summer of 1967 to restore, the crazy quilt of wools, dated 1886-1887, given to us by a dear friend, and the armadillo which holds the contents of Grandma Beulah's sewing basket. Beulah preferred crochet, bingo and driving in second gear, but I remember the sewing basket. Many of the wooden thread spools used to make Mike's chess set, in honor of the Bobby Fischer matches, also came out of that same basket. The new and old, all precious and comfortable here for you to enjoy. Our research seems to show that this was always a place of happiness and good living, we hope you find it so. There are many stories, for each and every room, too many to relate here. Just ask when you come to the SOUTHERN HOTEL, we're proud of this project and always pleased to talk about it. Thanks to you, our guests, and to all the family members, friends and experts who made it possible, we're continuing to change and grow every day.